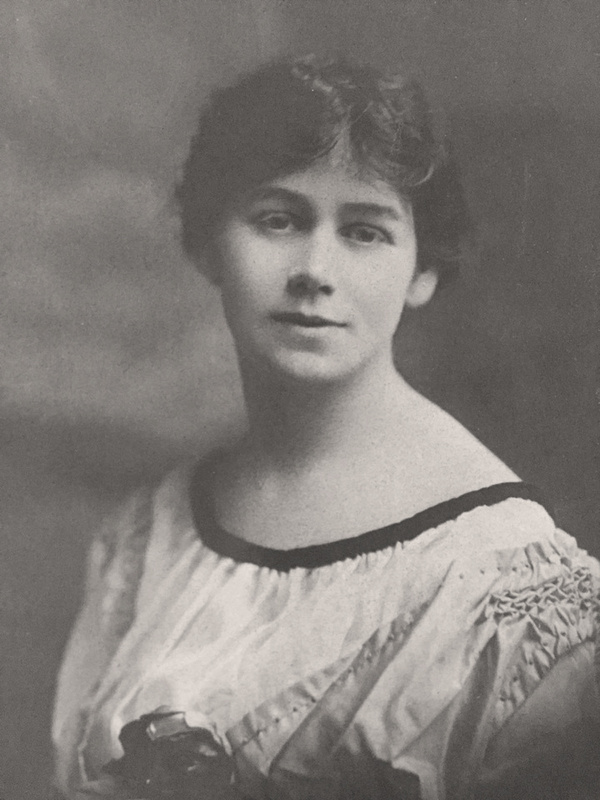 Caroline Loretta O'Neill was the youngest daughter born to Michael O'Neill and his second wife Ellen M. Cunningham. Caroline was born 4 August 1887 in Clarion County, Pennsylvania. Caroline never married. She lived to be 97 years old. Caroline died on 13 November 1984 in Pittsburgh, Allegheny County, Pennsylvania. She is buried at Calvary Cemetery with her sister Winifred Agnes O'Neill and her brother-in-law Robert Alphonsus McDonald. She was affectionately known as "Aunt Carrie", "Aunt Honie" and "Aunt Pokie" by the family. 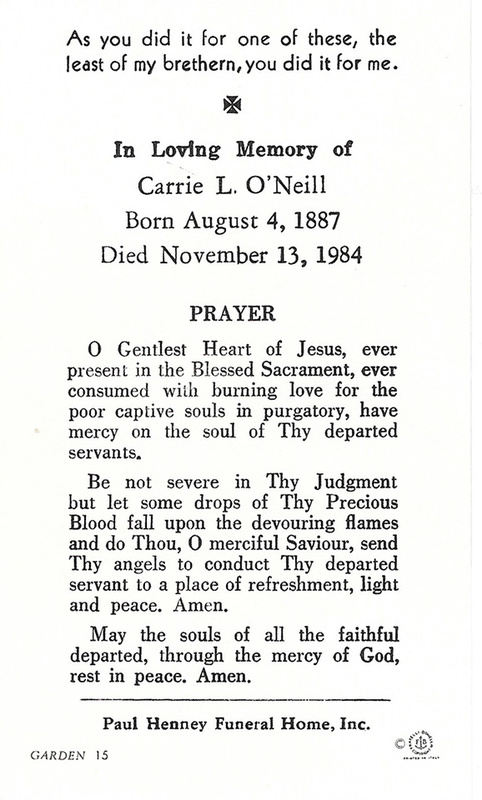 The prayer card from Caroline's funeral originally belonged to Caroline's niece Virginia McDonald Geary. 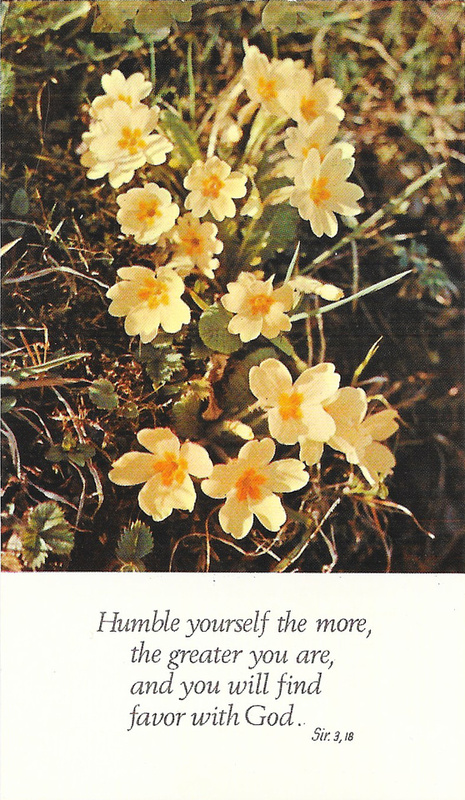 Virginia's daughter kindly sent the prayer card to me to incorporate into the family archives. Virginia McDonald Geary is my 1st cousin 3x removed. She is the daughter of Ambrose Aloysius McDonald, my 2nd great uncle and Gertrude Anna O'Neill, my 2nd great aunt. My relationship with Virginia McDonald Geary is unique in that we are double 1st cousins 3x removed. We share two sets of common ancestors. Our common McDonald grandparents are Michael McDonald and Anna Haggerty. Our common O'Neill grandparents are Michael O'Neill and Ellen Cunningham. Caroline Loretta O'Neill is my 2nd great aunt. She is the sister of 2nd Great Grandmother Winifred Agnes O'Neill. Robert Alphonsus McDonald is my 2nd Great Grandfather. Find A Grave. Memorial Number 107591661.